Summary: A Torch Against the Night takes readers into the heart of the Empire as Laia and Elias fight their way north to liberate Laia’s brother from the horrors of Kauf Prison. Hunted by Empire soldiers, manipulated by the Commandant, and haunted by their pasts, Laia and Elias must outfox their enemies and confront the treacherousness of their own hearts. An Ember in the Ashes was one of my favourite books of 2015 - it absolutely blew me away with its complex characters, sizzling romance, and world building. I have been eagerly anticipating the sequel ever since, so I was beyond excited when I was kindly sent a copy for review from the publisher. Having read it I can say without a doubt that it is a brilliant follow up that does not suffer from middle book syndrome! I have to admit that I wasn't the biggest fan of Helene in An Ember in the Ashes. She did, however, win me over in A Touch Against the Night. I think that getting her POV helped a lot. It made me understand and sympathise with her more. Being Emperor Marcus's Blood Shrike meant she had to make some tough decisions and I really felt for her. A new character, Harper, a member of the Black Guard, was introduced and man was I intrigued by him. We learn little titbits about him, but not much so he's still a bit of a mystery. I especially enjoyed his interactions with Helene, and I'm not going to lie, I was shipping them. Elias and Laia are also tested in A Torch Against the Night. Their journey to Kauf is not an easy one, and they go through a lot physically and emotionally. The character development is really well done; I like them both even more than I did in the first book if that's possible. Although Laia is not able to fight in the same way as Helene, she still manages to hold her own. She has a quiet strength and determination which I find really admirable. Elias is faced with dark times in ATaTN, but his strength and unwillingness to give up never wavers. Elias and Laia made quite the duo; I appreciated the fact that they told each other the whole truth, and didn't keep anything back. It can be annoying when two characters, who are in a sticky situation, could have avoided the whole thing had they communicated better. I was majorly shipping Elias and Laia in An Ember in the Ashes, but I did have one problem with the romance in the first book: the love triangles. I really dislike them, so the Helene/Elias/Laia and Elias/Laia Keenan triangle frustrated me to no end. I felt like with Helene and Elias there was a missed opportunity to create this amazing platonic relationship between a female and male character. As for Laia, her feelings for Keenan seemed to come out of nowhere; it just didn't make any sense to me. Suffice to say that the love triangle had me worried what direction the romance would take in the sequel. 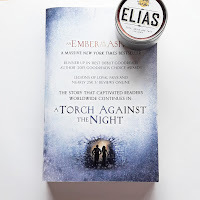 Having read A Torch Against the Night I am *highlight to read spoiler* happy that the Keenan/Elias/Laia triangle was resolved, and only hope now that the Elias/Laia/Helene triangle won't appear in the third book, because it wasn't really present in this one. There were a few swoony Elias/Laia moments in ATaTN that I absolutely loved. The tension and chemistry between the two was just perfect. A Torch Against the Night offers more everything: violence, action, plot twists, and deaths. Oh my gosh, the deaths! *cries* The ending left me feeling ALL THE FEELS and begging for book three. The wait is definitely going to be excruciating! Ooh, this sounds like a great book! Loved the review! The book sounds awesome and I can't wait to read it. But i think as a major Helene/Elias shipper, i'm going to be disappointed in that aspect.